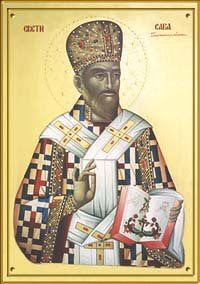 Fresco Iconography of St. Nicholas Serbian Orthodox Church in Hamilton, Ontario: Nikoljnik Press, 2005. 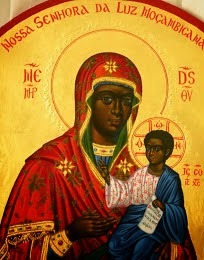 Icon by Fr. Theodore Jurewicz. The martyrs are commemorated together on September 13, although a number of them are also commemorated separately, as the dates of their martyrdom are known. This is a particularly poignant icon, because we have still among us survivors of the Ustasha terror of World War II, and many whose loved ones found martyrdom. 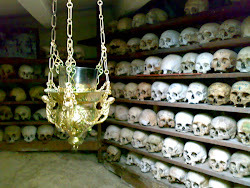 Moreover, it is an important icon inasmuch as it will witness not only to the faith of these martyrs, but also to the genocide of Serbs itself, which many ignore, forget or deny having occurred. A vast sea of haloed martyrs stands before a background showing the Jasenovac concentration camp in the upper left corner, with ominous grey walls, barbed wire and watchtowers. The Churches of Jasenovac (destroyed, sadly, twice now by Croats) and Glina (burnt to the ground with 500 Serbs in it) are shown centrally, while the upper right corner shows one of the many caves of Lika, Dalmatia, Bosnia or Hercegovina that became the graves of numerous innocents. In the lower foreground is a river perhaps the Sava, the Una, the Vrbas, or the Drina, all of which carried the tortured bodies. They bear crosses and appear peaceful, as they have accepted their martyrdom. The standing figures in the foreground are identified individually with an inscription in their halo. What touches many of us when we contemplate this fresco is that these Holy New Martyrs are every man: a peasant, a student, a teacher with her pupils, a nun, an old woman, a priest, a bishop, a child. All of them were killed for the simple fact that they were baptized in and lived by the Orthodox faith. 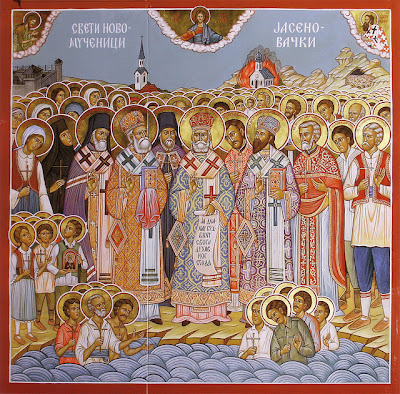 For this, they are crowned with martyrdom; Christ blesses them, while on either side St. John the Baptist (patron of the Jasenovac Church) and St. Sava (patron of the Serbian people) intercede on their people’s behalf. "For us Orthodox Christians, this is not 'the City of the Dead,' but the City of Alives, as for the Lord all the martyrs - victims of Jasenovac - are alive. The innocent victims of the Great-martyrdom of Jasenovac live in our hearts, as well as in our souls, in the memorial prayer of recollection. 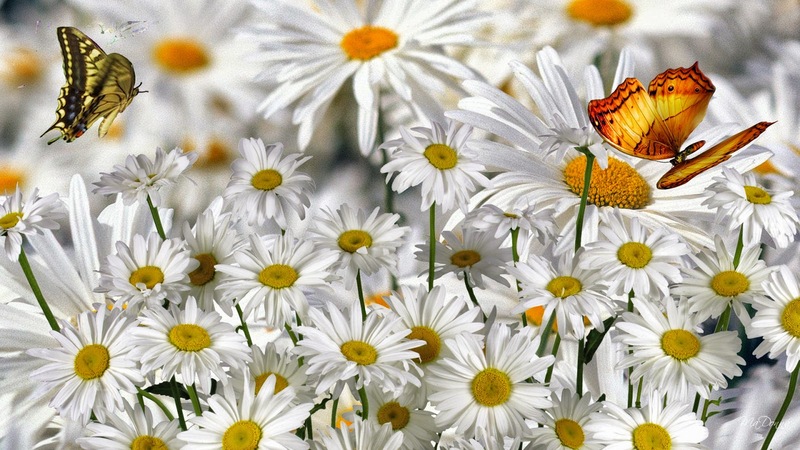 All of them, together with us, await for the resurrection of the dead and life of an age to come." Read also: What Was Jasenovic Concentration Camp? 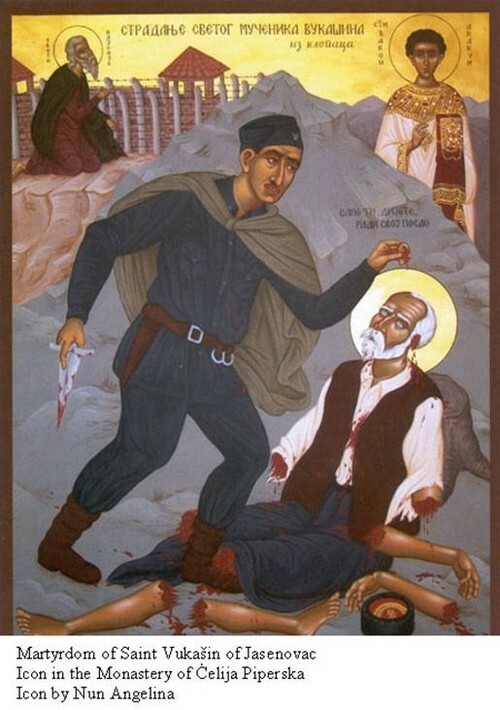 Our father among the saints, Vukašin of Klepci (in Serbian: Свети Вукашин из Клепаца), was a Serbian Orthodox Christian from Herzegovina who was martyred by fascists during World War II for refusing to acknowledge the Ustashi leader. He is remembered on May 3 under the new calendar. 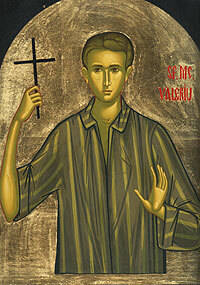 Little is known about the life of Saint Vukasin. What is known about him is from the event resulting in his martyrdom. He was born in the village of Klepci, in Herzegovina, at the turn of the nineteenth/twentieth century. At the beginning of World War II, members of the Croatian fascist Ustašas arrested him and transported him, together with other Serbs of that region, into the notorious concentration camp of Jasenovac (the number of victims at this camp have been estimated to be at least 700,000). After horrible days full of torture, Vukašin was brought before an Ustashe`s soldier who was supposed to execute him, but who said he would spare his (Vukašin's) life if Vukasin cried loudly: "Long live Ante Pavelic!". Ante Pavelic was the leader of Ustashe. Vukasin who saw a knife in the hands of the soldier, replied calmly: "My child, you do what you must", and refused to obey the soldier`s request. The Ustashe soldier brandished his knife and cut off Vukasin`s ear. The soldier then repeated his request. Vukasin repeated his answer. The soldier then cut off Vukašin's other ear, followed by his nose, and then scarred Vukasin`s face. Next his tongue was cut. After repeating the request to Vukasin to utter the vicious words and hail the Head of Ustaše (Ante Pavelic), Vukasin once again calmly replied: "My child, you do what you must". Distracted, the soldier eventually killed him, and afterwards went mad. At the regular session of the Holy Assembly of Bishops of the Serbian Orthodox Church in 1998, Vukašin, from the Klepci village, was entered into the List of Names of the Serbian Orthodox Church as a martyr. 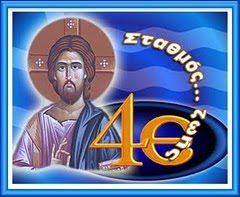 His feast day is May 16 (Julian Calendar). During the Second World War the Gornokarlovatsky Diocese found itself on the territory of the puppet Independent Croatian State and suffered in ways that had never been seen before. It seems as if most of the devilish evil of the Croat fascists fell to its lot. Obviously, the tragedy was that the Diocese was located in the very heart of the newly-formed State, very close to the Croat capital of Zagreb. During the genocide which took place between 1941 and 1945, 65 Orthodox priests were murdered by the Ustashi, 116 churches were completely destroyed, 39 others seriously damaged and over 160 parish and monastic libraries were completely or partially destroyed. Vladyka Sabbas was born on 6 July 1884 in Mol to the family of Stephen and Elizabeth Trlaich and was baptized Svetozar. After studying at grammar school and then seminary in Sremski Karlovtsy, he graduated from the faculty of law at the University of Belgrade. He was ordained deacon and then priest in 1909. From 1909 to 1927 Fr Svetozar served as a parish priest. In early 1927 he was appointed to an administrative post at the Holy Synod and then became its secretary. Widowed, in 1929 he took his monastic vows with the name of Sabbas and became rector and archimandrite of the Monastery of Krushedol. He served there until 1934, when he was appointed Vicar-Bishop of Sremski. 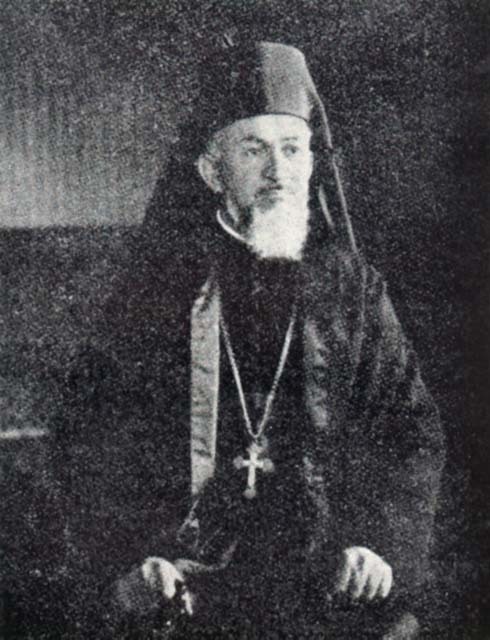 He was consecrated bishop in Sremski Karlovtsy on 30 September 1930 by Patriarch Barnabas of Serbia. As Patriarchal Vicar, Vladyka Sabbas chaired the diocesan council of the Archdiocese of Belgrade-Karlovtsy until November 1936 and from then until early 1937 he chaired the ecclesiastical court. Then, on 4 September 1938, he was appointed Bishop of Gornji Karlovac, with his residence in Plashkom. The German invasion of Yugoslavia and the ensuing proclamation of an Independent Croatian State saw Plashkom occupied by the Italians, but at the end 1941, it was handed over to the Croat Ustashi. On this, Bishop Sabbas and nine priests were taken hostage. On 23 May 1941 the Ustashi occupied the bishop's residence and expelled the bishop. 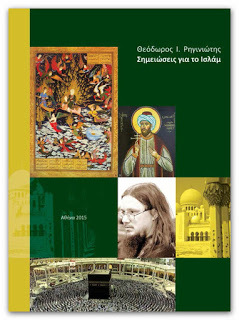 On 8 June the notorious executioner Josip Tomlenovich appeared at the residence and ordered any diocesan money and papers of importance to be handed over to the Ustashi. 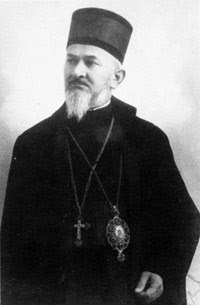 Bishop Sabbas was ordered to leave the town and head for Serbia. However, he refused to do this and stated that he could not abandon his diocese and his people. On 17 June 1941 Vladyka was arrested together with other well-known Serbs and priests who did not wish to leave the place of their ministry. The Ustashi locked their prisoners into a cowshed and set an armed guard. For one month all those arrested and especially Bishop Sabbas were subjected to humiliation and torture on a daily basis. They were then sent to the notorious concentration camp at Gospich. The prisoners were taken from the railway station at Gospich to the local prison and again subjected to humiliation and torture. In the first half of August 1941 about 2,000 Serbs were taken from Gospich to Velebita, Bishop Sabbas among them. It is supposed that he was murdered there, at the same time as about 8,000 other Serbs, in August 1941. 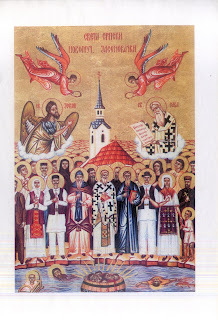 The Holy Synod of the Serbian Church constantly, but unsuccessfully, called for the forces of occupation to explain what had happened to Bishop Sabbas and other Serbian bishops on the territory of the Independent Croatian State and tried to obtain their release. In 1941 the Gornokarlovatsky Diocese was under the control of the dreadful Ustashi regime. The bishop and the priests were told that they were undesirables and that they must abandon their flocks. The Roman Catholic Archbishop of Zagreb, Aloysius Stepinac, openly told Vladyka that he must leave "Croatian" Karlovac, otherwise he would be liquidated. 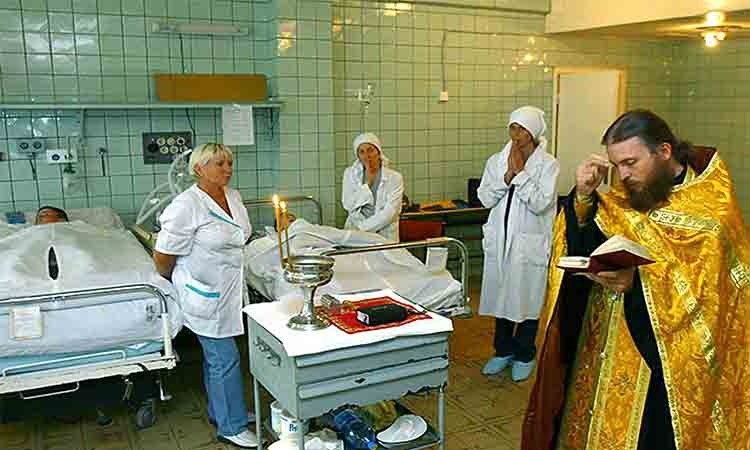 Vladyka answered him: "Even if it costs me my head, I will not abandon my people!" Soon it became clear that the Catholic Archbishop was not joking. Vladyka Sabbas was arrested and horribly tortured. 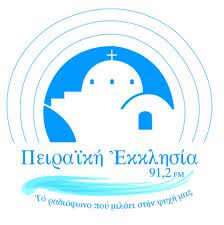 During the tortures and beatings in Plashkom, the Ustashi used a gramophone to play the hymn, "As many as have been baptized in Christ, have put on Christ." A few years after this a stranger walked into the church in Bashaida, where Vladyka had served. He spoke to the postmaster Sabbas Saravolets. "Did you know Vladyka Sabbas Trlaich," asked the stranger, "I heard that he was priest here." "I was an eyewitness of his sufferings," answered the stranger. "The Ustashi butchers took Vladyka to a clearing and continued to torture him there. They tore his skin off him and then covered him with salt. Then they buried him alive, with just his head protruding, brought an iron harrow and pulled it across his head until he gave up his soul to God. What happened after that, I don't know. Maybe the Ustashi threw him into one of the many precipices there, which they used as graves for the Serbs. So even in death he wasn't separated from his people." 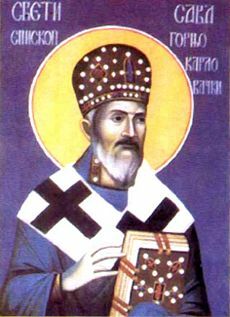 In 2000 Hieromartyr Sabbas was glorified by the Council of Bishops of the Serbian Orthodox Church as a hieromartyr. A true son of his people, he showed himself to be a true pastor, laying down his life for his flock, and his ministry was crowned by martyrdom. His memory is celebrated on April 22. Αναρτήθηκε από ΝΕΚΡΟΣ ΓΙΑ ΤΟΝ ΚΟΣΜΟ στις 1:37 π.μ. ΕΠΕΙΓΟΝ: τους παίρνουν τα παιδιά λόγω ανεργίας! 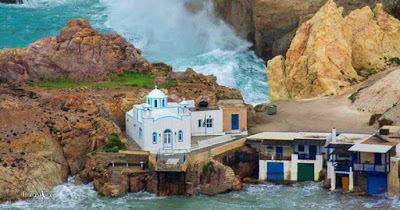 Όλοι οι άη Γιώργηδες της Ορθοδοξίας! 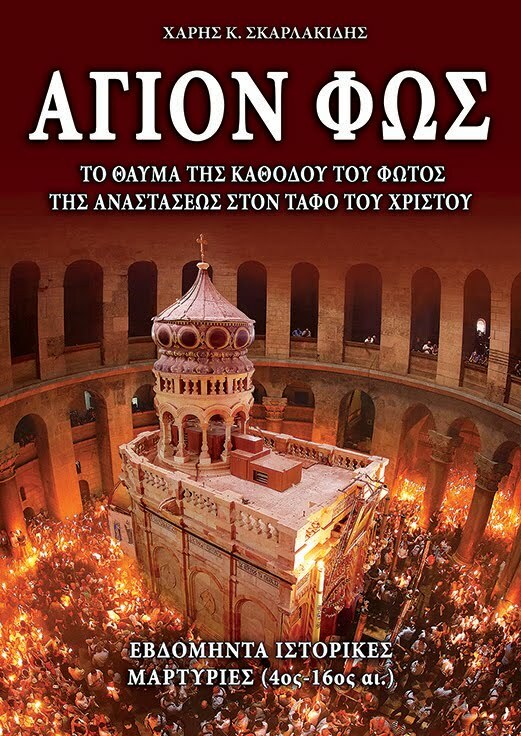 Χριστός ανέστη! Γι' αυτό... Έλα όπως είσαι! !